Was the brutal slaying of two men leaving a N.Y. mosque a hate crime? 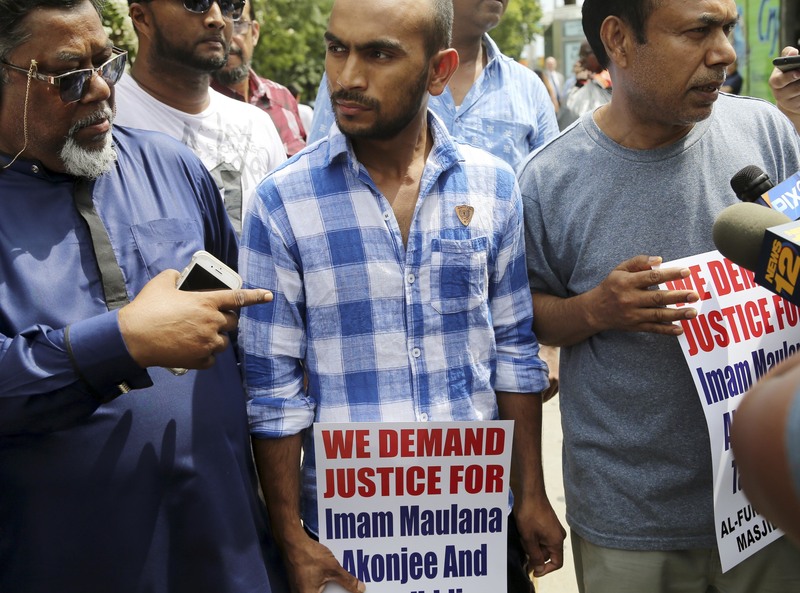 A 35-year-old Brooklyn man has been charged with the fatal double shooting of Imam Maulana Akonjee and his associate and friend, Thara Uddin, as they walked home following afternoon prayers at the Al-Furqan Jame Masjid mosque in Ozone Park, Queens, this past Saturday. The Queens District Attorney Richard A. Brown on Aug. 15 identified the defendant as Oscar Morel of Miller Avenue, Brooklyn. Morel is presently awaiting arraignment in Queens Criminal Court on a criminal complaint charging him with one count of first-degree murder, two counts of second-degree murder and two counts of second-degree criminal possession of a weapon. If convicted, Morel faces up to life in prison without parole. According to the criminal charges, Imam Akonjee, 55, and Mr. Uddin, 64, were walking home from the Al-Furqan Jame Masjid mosque on Glenmore Avenue in Ozone Park just before 2 p.m. on Aug. 13, when Morel came up behind the two men at the intersection of 79th Street and Liberty Avenue and fired multiple rounds, including a gunshot wound to the head of both victims. The two men were transported to a local Queens hospital where they were pronounced dead. The Associated Press reports that the killings have stoked fear and anger in the largely Bangladeshi Muslim community in Queens and Brooklyn, where residents have described harassment in recent months by people who shouted anti-Muslim epithets. Mohammed Nuruzzaman, 31, told the AP the community was anxious to know more about why the men were targeted. "Why he did it—that's the very important thing. What is the motive?" he said. "Did he really do it or is somebody behind it? That's the kind of thing we want to know." Police said officers searching the Brooklyn home where Morel was arrested late Sunday found the suspected murder weapon—as well as clothes they believe he was wearing at the time of the shooting—behind a section of the wall that had been cut out and reinstalled with screws. Amado Batista, a maintenance worker at Morel's building, told the AP that Morel worked night shifts and had lived in the apartment for eight months. Batista said Morel kept to himself. Police believe Morel was waiting on the block near the mosque for several minutes on Saturday before he shot each victim in the back of the head then fled in a black GMC Trailblazer. They later learned that a car matching that description struck a bicyclist nearby only 10 minutes after shooting. After finding vehicle parked on the street, police waited for Morel to return. He was captured after getting into the car and ramming a police car while trying to flee. The Majlis Ash-Shura has begun fundraising to benefit the families of the victims at https://www.gofundme.com/ImamsMaulama-Thara with an initial pledge of $10,000. Includes reporting from the Associated Press. Are instances where Muslims attack Jewish students all over the country, hate crimes? Don't recollect a "Go Fund Me" Appeal in America before... Is this a new approach editorially? I am particularly interested in the Pakistan "Asia Bibi" blasphemy Case. Will future appeals be for funding be worldwide, or in the USA Citizens only? I don't understand why the emphasis on "Hate Crime", If someone shoots me and I die, should not his punishment be the same whether he liked me or not ? I agree, in fact I see the entire "hate crime" concept as troubling. In this case the suspect already faces a sentence of life without parole, so why exactly is it important to pile "hate crime" on top of everything else? Really, is there any debate over which is worse: hating someone or shooting him in the head? If I shoot you because I hate you is that any worse than shooting you to take your wallet? I think what is going on here with the clamor to declare this a hate crime has nothing to do with this particular shooting, but is made in anticipation of using the "hate crime" label in the future against much more benign activities, such as comments and protests.